Well hello there! You are in for a treat today! I’ve got another perfectly lovely printable that I you’re really going to dig. 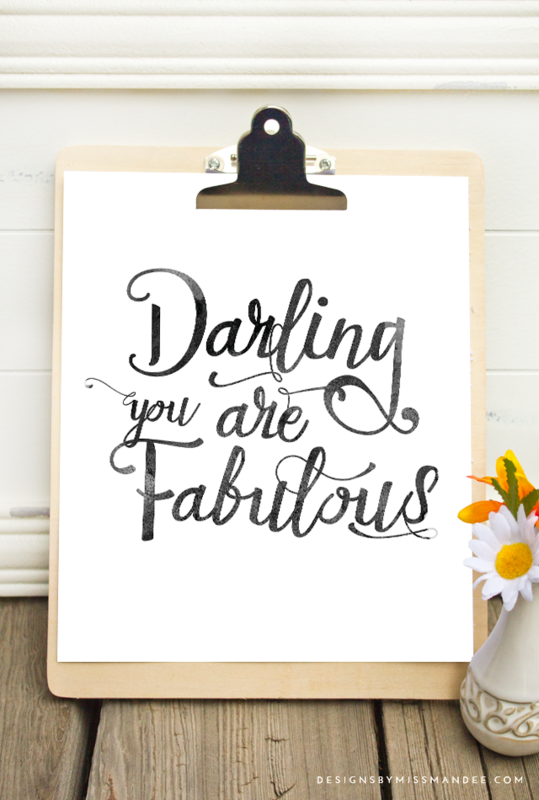 Check out this fun, textual design: Darling, you are Fabulous. If you’ve ever at least dabbled in design, then you know how fun it is to play with fonts! I have been having a blast lately: creating multiple typographic designs using cool script fonts and stylistic flourishes. The font I used for this design is called Evelyn. If you like the look of this quote, then you’ll definitely want to check out the awesome one I shared a little while ago. I’m just really digging this hand drawn, ink look lately! When I was deciding on a phrase to use for this design, I thought about this blog, my readers, and, well, I just knew that whatever I did, it had to include the word “fabulous.” I think you’re all fabulous, and I love sharing my designs with you! The last design I shared was a fun summer-themed printable, that I’m sure you’ll love as well. Printable quotes like these make fun decorations for home and office spaces alike! This design would make a sweet addition to a gallery wall. It would also make a unique and cute present. Throw it in a frame, and you’ve got yourself a super simple, beautiful, and cheap gift for a friend. My BFF’s birthday is coming up, and you better believe she is getting this bad boy! She is the epitome of fabulous. So, if you have a beautiful and fabulous friend or family member, you now have a great gift idea locked and loaded (you’re welcome). What are your plans for this fabulous printable? This is perfect for my guest bathroom! I might also print a few extra and tape them to public restroom mirrors! Thank you for sharing! This is so beautiful. I had no idea it was a font – it looks like real lettering! Thanks Carmia!! Yeah, I love brush fonts like this. As always, your design is gorgeous! Thanks for linking up at The Handmade Hangout! I’ll be featuring you on my blog (www.occasionallycrafty.com) tommorrow when the new linky goes live at 6pm ET! Hope to see you there! Thanks for the kind words and awesome news Valerie! !